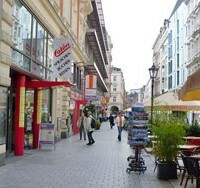 The second biggest city in German, offering its visitors a selection of arts and culture. The fastest way to improve your language level with our intensive 5*5 course! Accommodation and residences 2 minutes from the school, either with host families or shared apartments. 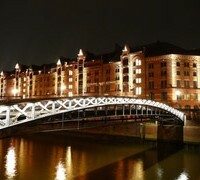 The second biggest city in Germany offers its visitors a huge variety of art and culture. From international musicals, marvellous museums, opera, ballet, cuisine to great nightlife, you will definitely never run out of things to do. This German city is considered one most worth a visit. 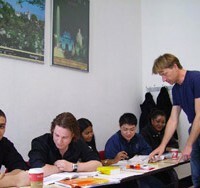 Between 5 – 12 students a class, available to all lives A1, A2, B1, B2, C1, and C2. You can choose between morning classes (8:50am – 1pm) or afternoon classes (1:30pm – 5:45pm). A minimum of one week of classes is required. Classes start on the first Monday of every month. Residences 2 minutes from the school: Minimum 4 weeks stay. Individual, double or triple rooms available. Shared bathroom and kitchen. TV and Wifi in rooms. As well as a shared pantry area with coffee machines, refrigerators and microwaves. Entry and exit every Friday 12 – 6pm. Towels and sheets included, with room cleaning on Mondays and Fridays. Host families: a distance of 45minutes by subway, ask for fares. However, it is the best way to fully immerse yourself in German language. Shared apartments: minimum stay 4 weeks. Arrival on Sundays and leave Saturdays. Enrolment, Informational material, textbooks (19 euros per level), proof of your progress from when you start to the end, and an accredited final diploma. Airport transfers to and from the airport, medical insurance, cancellation of the flight is not There is public transport direct from Berlin airport and Hamburg. Berlin-Schönefeld airport is 24km southeast from Berlin and Tegel airport is the main airport in the capital. Both have buses to the city center.